Small heavy duty platform dolly with 400 lb. weight capacity. 19 inch x 29 inch non-skid vinyl deck surface. Steel frame construction. 32 1/2 inch handle folds down for compact storage. Includes 4 inch caster wheels. 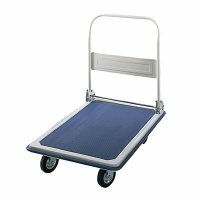 Great for transporting heavy items with very little effort.